Up to $10,000 in online bookings – per day! With the amount of qoutes coming in and our new sales strategy, we have taken 16 bookings today so far totalling just over $10,000. 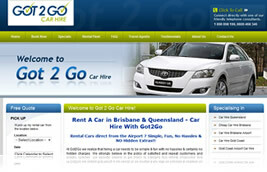 Got2Go Car Hire is an independent car hire company operating in the South-East Queensland region. Got2Go was acutely aware of the power of online marketing to generate online enquiries, but frustrated by an ineffective website that was being held back by a number of technical and marketing-related problems. The nature of the car hire industry is that there are a handful of large competitors with deep pockets to invest in new client acquisition. Any successful new customer marketing strategy for Got2Go would have to negotiate the competitive landscape while delivering qualified enquiries at low cost. Rectify technical issues that were preventing transactions from occurring. Redesign and relaunch the website for higher conversion and ease of ordering. Rebuild and optimise Pay Per Click (Google AdWords) campaigns to decrease cost per click and cost per enquiry. Create a steady stream of qualified enquiries for the sales team to convert into car rental bookings. Test, monitor and optimise in real time to steadily increase results. Response-oriented website redesign, aimed at increasing enquiry volume in the target market. Additional web copywriting to differentiate Got2Go and motivate website visitors to enquire. Extensive rebuilding of Google AdWords account, including advanced keyword research, ad writing, conversion tracking and testing. Website technical issues resolved – bookings can be made without a hitch via a new, streamlined order process. Got2Go website is transformed into a lead generation machine producing more enquiries in a single day than were previously generated in a month. 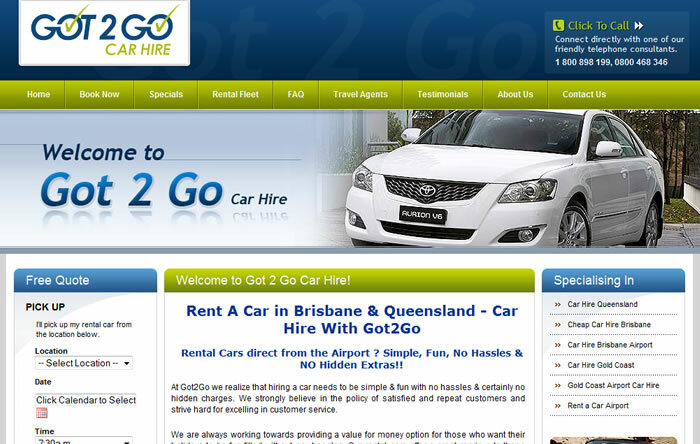 Complete management of web strategies for Got2Go so they can get on with what they do best. As business owners we were aware that customers are increasingly searching for car hire companies via the web, but we were frustrated by an out-of-date website that made it difficult to do business with us. We engaged Marketing Results to solve our website problems and convert our site into a marketing tool, not just an online “brochure”. The changes they made to our website are not only a huge improvement from a graphical point of view, but the site is now producing results. We are getting more sales leads at lower cost from the Internet than we ever did. We have even done more than $10,000 worth of bookings in a single day, all through the website.